The Cole Memorial Medical Group announced the addition of Adriane Pierce, PA-C, to the Internal Medicine team. Adriane completed a Master of Science Degree in Physician Assistant Studies from King’s College in Wilkes-Barre, Pennsylvania, where she also received a Bachelor of Science Degree in Medical Studies, with a minor in Biology. Adriane holds several medical certificates including certification as an Emergency Medical Technician. In addition to her recent experience as a Physician Assistant at Upper Allegheny Medical Center, Adriane worked as a Certified Nurse Assistant at Cole Memorial Hospital’s Skilled Nursing and Rehab Unit from 2008 to 2011. 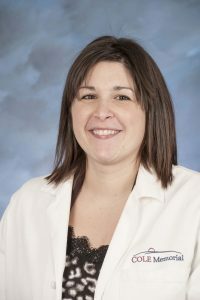 Adriane is a member of the Pennsylvania Society of Physician Assistants. Internal medicine at Cole Memorial combines primary care with a hospitalist program. Cole’s highly-skilled Internists and Hospitalists apply their specialized clinical expertise for the diagnosis, treatment and compassionate care of adults across the spectrum, from health to complex illness. For more information or to make an appointment with Cole Memorial’s Internal Medicine team, call 814-274-5276 or visit www.colememorial.org.